BOGSFOOTWEAR.CA -- Boots and shoes designed to handle anything you put them through – mud, crud, dirt, grime. These durable, 100% waterproof boots will keep you protected and comfortable - NEW Max-Wick moisture-wicking lining to help instantly disperse moisture away from the foot better than any rubber boot on the market. Bogs’ proprietary Neo-Tech insulation and four-way stretch inner bootie, providing the ultimate cushioning and warmth. Hand-lasted, natural rubberBoots and footwear for every season. Rated to -40 degrees. EBAMBU -- A Canadian online store offering a wide array of natural health products including Nutraceuticals, baby products, sports nutrition and home essentials at affordable prices. 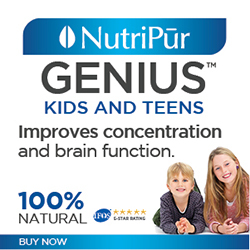 Nutripur Genius products for children. Free shipping for orders over $59. HSSWEDEN HAPPY SOCKS --Socks of ultimate quality, craftsmanship and creativity in unique colors and designs. An almost endless variety of socks and underwear, created from a broad spectrum of color combinations and original patterns. Simply put: There’s a pair of high-quality socks and underwear for every occasion, mindset and style. 40% off all products while supplies last. No Code Needed. KIMMYSHOP.COM -- A Canadian-based e-tailer of licensed character products - toys, videos, backpacks, bags, stickers, magnets, party supplies. Bags, backpacks, lunch bags featuring Transformers, GI Joe, Pokemon, Max & Ruby, Caillou, Aquadoodle, Toy Story, Bakugan, Backyardigans, Disney Ariel, Disney Cars, Cranium, Batman, Kai Lan, Littlest Pet Shop, Go Diego Go, Little People, Zhu Zhu Pets, Disney Princess, Disney Tinkerbell, Spider-Man, Dora the Explorer, Hannah Montana. FREE SHIPPING on orders over $99! 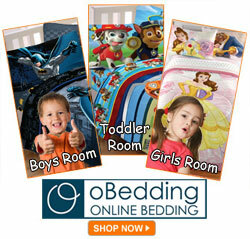 OBEDDING.COM -- Online Bedding Superstore specializing in children's bedding, bedroom decor, etc. from toddler to teen - Backyardigans, Curious George, Disney Princess, Dora and Diego, Hello Kitty, Spongebob, Winnie the Pooh, Harry Potter and lots more. Stress-free Holiday Shopping at oBedding.com! Stay warm this holiday with Paw Patrol Pups Flannel Twin Sheet Set! or with Disney's Frozen Winter Wonderland Bed Sheets! Great prices. US company shipping to Canada. TURNAROUND: TURNING FEAR INTO FREEDOM -- A multi award-winning audio treatment program that teaches your child how to stop anxious thoughts, calm uncomfortable feelings, and use the most effective strategies, cognitive behaviour therapy, to overcome anxiety. TVSTOREONLINE.COM -- Your source for classic TV and movie shirts and memorabilia - 1000's of TV and Movie T-shirts. Marvel Comics Characters! Dr Suess Merchandise! BABYGRINS.CA -- Good quality, modern and unique baby products from Leduc, Alberta boutique - Baby Gear (0-2 years), Toddler Gear (2-5 years), Mommy & Daddy Gear, Announcements and Gift Baskets. BYNATURE.CA -- A unique mother-owned, Canadian online baby store, located in Ontario, with a missionto be your partner in parenting by helping you find the information and products you need to give your children a most precious and wonderful gift: the gift of a healthier, better life and future. CODY PARTY CENTER -- Ottawa company supplying everything needed for a successful party, whether it's a formal wedding reception, a corporate function, special event, party or a simple celebration with loved ones, you'll want to make a lasting impression. CREATIONS ELIN -- Hand painted kids room decor crafted with old fashioned care and integrity. Each piece is lovingly created to produce a one of a kind product which can be personalized to coordinate with bedding or room decor. GRAB CART.COM -- An online shopping website providing quality service to valuable customers since 2003 and striving to list all products with lowest possible prices. Smart buyers find the best prices in this solid core and unprecedented shopping network. LOVABLE LABELS -- The fun and unique way to identify children's belongings but good for adults, too. Extra tough (dishwasher, microwave, washer and dryer safe), colourful and fun. Personalize with names, initials or anything you choose. Have your child select his or her favourite icon! OLIVIA ROSE -- Hand made collection of designer pettiskirts/petticoats and girls fashions which will have your sweet princess dreaming of her favourite fairy tale. A premium, high-end/ luxe line of baby, girls and ladies designer fashions in collections that are timelessly classic and are perfect for everyday fashion, dress-up, parties, dance recitals, portrait sessions, weddings and many other special occasions. PEEKABOO BEANS -- A fresh approach to playwear - designs based on imaginative themes with the comfort of little customers in mind, and developed to create easy care and maintenance clothing to make life easier for parents. The result - children's play clothes that are functional and stylish, too. Playwear for kids on the grow - boys and girls ages 1-8.